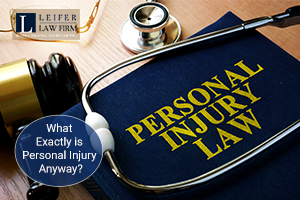 What Exactly is Personal Injury Anyway? What does personal injury mean to you? For many people, it is a commercial on radio or TV, in which a lawyer screams about how much money he or she can get you after you suffer an injury. In fact, you don’t have to have an injury to file a personal injury claim, although the majority of these claims involve someone getting hurt. Let’s take a look at some of the most common types of personal injury cases. Car accidents – car accident injuries can range from whiplash to paralysis. Truck accidents – commercial trucks remain a danger on the road, and factors such as fatigue, speeding, and driver distraction can cause a devastating accident. Wrongful death – wrongful death is a civil claim against someone that you believe caused the intentional death of a loved one. There is no physical injury in these cases, however, there is loss, and plaintiffs can sue for future income that was taken away when their loved one was killed. Premises Liability – premises liability refers to personal injury claims in which the plaintiff suffered an injury on another person’s property. The owner of the property may be held liable if it is proven that he or she was negligent and allowed a dangerous condition to remain unchanged, which directly led to plaintiff’s injury. The most common type of premises liability cases are slip-and-fall accidents. Medical Malpractice ­– medical malpractice is a personal injury claim that holds doctors, surgeons and other health care professionals liable when an error or mistake they made leads to the injury or physical damage of a patient. Medical malpractice can range from wrong site surgery in which surgeons operate on the wrong body part, to prescribing the wrong medication. All personal injury claims are not the same, and there are specific things you must prove for each type of accident. And in many types of personal injury, fault is determined by the negligence standard, which can be difficult to prove. That’s why it’s important for you to hire an experienced personal injury law firm such as the team at the Leifer Law Firm. We understand how to pursue personal injury claims, and our track record speaks for itself. Please call us today at 561-660-9421 for a free consultation.